Russia may deliver first upgraded MiG to India in 2011. Russia could deliver the first modernized MiG-29 fighter jet to India as early as in 2011, the head of the United Aircraft Corporation (UAC) said. 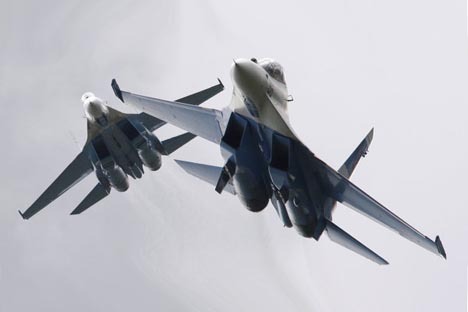 India signed a $960 million contract with Russia in 2008 to upgrade its five squadrons of 69 MiG-29 fighters, which have been in service with the Indian Air Force (IAF) since mid-1980s. "The first upgraded plane, I think, will be delivered in 2011," Mikhail Pogosyan said on the sidelines of the Aero India 2011 air show, which opened on 9th of February in Bangalore. "The whole upgrade program will be carried out on schedule agreed with the Indian side, and it will take several years to implement it," Pogosyan said. The upgrades include a new avionics kit, with the N-109 radar being replaced by a Phazatron Zhuk-M radar. The aircraft is also being equipped to enhance beyond-visual-range combat ability and for air-to-air refueling to increase flying time. The upgraded aircraft will be armed with sophisticated air-to-air missiles, high-accuracy air-to-ground missiles and 'smart aerial' bombs. In 2007, Russia also sold India's Hindustan Aeronautics Limited (HAL) a license to manufacture 120 RD-33 series 3 turbojet engines for the upgrade. The first six aircraft are being upgraded in Russia while the remaining 63 will be refitted at the HAL facility in India.